One year ago, students in Associate Professor Anne Giangiulio’s Graphic Design 4 class were given the opportunity to create work that would potentially be seen by thousands of people on a daily basis. The first week of April, that potential became reality for six innovative young designers whose work was selected by Sun Metro to be displayed in their fixed-route buses and downtown transfer center. Graphic design major Adrian Bautista was one of the six students whose Centennial-themed work was chosen for production by Sun Metro as part of their ongoing partnership with UTEP. Having the work he completed months ago finally introduced to the public at a special event attended by UTEP President Diana Natalicio, El Paso Mayor Oscar Leeser and Sun Metro Director Jay Banasiak made it all worth the wait. On Wednesday afternoon, Natalicio, Leeser and Banasiak each spoke before introducing the students and their work to the crowd gathered at the bustling downtown transfer center on Santa Fe adjacent to the Paso Del Norte International Bridge. Applause and audible “wows” followed the unveiling of posters featuring the students’ colorful and striking design work. The production of lobby posters for the downtown transfer center and horizontal placards that will hang above windows in all fixed-route Sun Metro buses is another in a long line of collaborative efforts between the University and the local mass transit system, with major milestones including the Glory Road Transfer Center and Parking Garage and its murals depicting the 1966 NCAA men’s basketball team. Before this design project began in early 2013, Sun Metro Marketing and Public Affairs Coordinator Laura Cruz-Acosta visited Giangiulio’s class to give students an overview of what the company was looking for. Since each student was assigned a project based on a raffle system, Bautista ended up working on the Sun Metro project purely by chance. He then took the initiative to follow up further with Cruz-Acosta once he received his assignment, requesting more information about the history of public transportation in El Paso. Bautista’s design focused on merging past and present, so he made use of photographs of the city’s old trolleys. His design focused on typography spelling out the UTEP–Sun Metro Centennial partnership inlaid into the shape of a trolley. Menchaca wanted her design to have vibrancy and humanity, which led her to create work that was very different from her classmate Bautista. The drawing major worked on images of students inside the buses and kids waving at buses as they passed by before she decided upon her final image of a bus filled with students all in the form of UTEP’s iconic pickaxe. She credits Giangiulio with providing the guidance to formulate her ideas into useable design. Bautista hopes his work with Sun Metro reaches the eyes of creative directors at firms in El Paso and gives him a positive boost when he looks for a job after graduation. 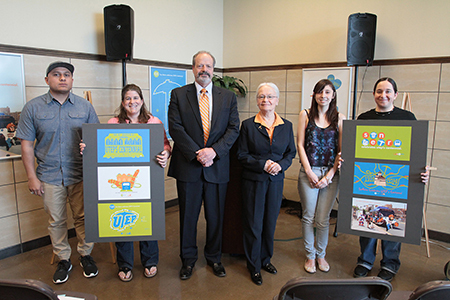 Before the unveiling of the student work, Leeser remarked on the importance of public art to the City of El Paso, commending the partnership between UTEP and Sun Metro as one that puts an important spotlight on young, local talent. He lauded the work that both entities have done in moving the city forward on many levels. Giangiulio’s short speech highlighted how public exhibition of the students’ work is a boon and made particular note of how the project ties to UTEP’s Centennial. In addition to Bautista and Menchaca, Sun Metro selected work by students Yvonne Aceves, Monique Deitrick and Diana Saenz. Each poster and placard includes the name of the student who created the design, which offers the opportunity for further networking and employment opportunities for the students. Giangiulio couldn’t be happier.